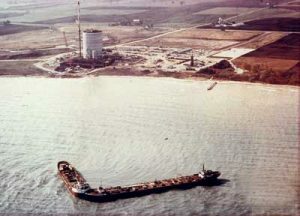 In this photo from the 1970s, barges from KPS Construction help in the construction of the Kewaunee nuclear reactor on Lake Michigan. Federal plans envision the use of barges like these to move hundreds of tons of highly radioactive waste fuel rods from the now closed Kewaunee reactor to the port of Milwaukee. Photo by Power Engineering online. [Albuquerque, NM] Ten organizations* and two industry groups** blasted Holtec International’s application*** to the US Nuclear Regulatory Commission (NRC) for a license to build and operate the world’s largest nuclear waste dump in New Mexico. The waste, from commercial nuclear power is currently at the reactor sites where it was produced. Opening a high-level waste dump, if licensed, would lead to tens of thousands of ongoing high level radioactive waste shipments on rail, truck and boat for decades. Deadly containers would pass through nearly 90% of U.S. Congressional districts including neighborhoods, cities, farmlands, lakes, rivers and ocean-fronts. The waste is the hottest, most concentrated atomic waste from the nuclear fuel chain, misleadingly dubbed “spent” fuel. This radioactive waste can cause death in minutes if unshielded, and remains radioactive for literally millions of years; it is one of the most deadly materials on Earth. The organizations are demanding that the NRC Atomic Safety and Licensing Board halt the Holtec licensing because it is illegal. The federal Nuclear Waste Policy Act of 1982, as Amended, only allows the U.S. Department of Energy (DOE) to take ownership of irradiated nuclear fuel at an operating permanent geologic repository. Such a title and liability transfer to DOE at the “interim” site proposed by Holtec, is not allowed. The wise precaution was included in the law to safeguard against an “interim” surface site becoming de facto permanent in the absence of a permanent repository. The Holtec site would not be suitable for long-term isolation and, in the view of those challenging Holtec, it is also not suitable for short-term storage. The Holtec license application says the lethal waste at the site would be owned by either the Department of Energy (DOE) or the nuclear utility companies that made it. But at the hearing, Holtec’s lawyer, Jay Silberg, admitted that under current law DOE cannot take title and ownership of the waste at an “interim” centralized storage site. This makes the proposal unrealistic. Holtec admitted they do not have a way to repair cracked storage and transport canisters but stated that since they are not expecting cracked canisters they don’t have to prepare to deal with them. Alliance For Environmental Strategies (AFES), based in southeastern New Mexico, is charging that the siting violates principles of environmental justice and that Holtec’s Environmental Report is totally inadequate in this regard.